In this week's episode, the gang heads down to the Big Easy with JCVD and Wilford Brimley in the 1993 action pseudo-classic, Hard Target! What is going on with all these accents? Is Lance Henriksen the Devil? And can everyone agree to stop saying "Daddy"? Plus: Wilford insists on doing all of his own stunts. Hard Target stars Jean-Claude Van Damme, Lance Henriksen, Yancy Butler, Arnold Vosloo and Wilford Brimley; directed by John Woo. 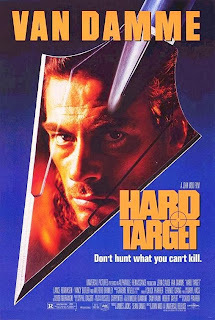 Well, I would like to know how many scripts you guys receive for "Hard Target, Easy Rain" before the end of the week. Yes! Nice choice. I personally love this movie, but I can see how someone else might not. It's excessive, to be polite. Is it Smoochy next week? Would make sense, it was the most hated thing for about a year, then everyone forgot about it. The main thing I remember is Edward Norton playing Mathew McConaughey. Wow, That was a HELL of a Nick Nolte impression man. How DARE you pull that out so late in this podcast.